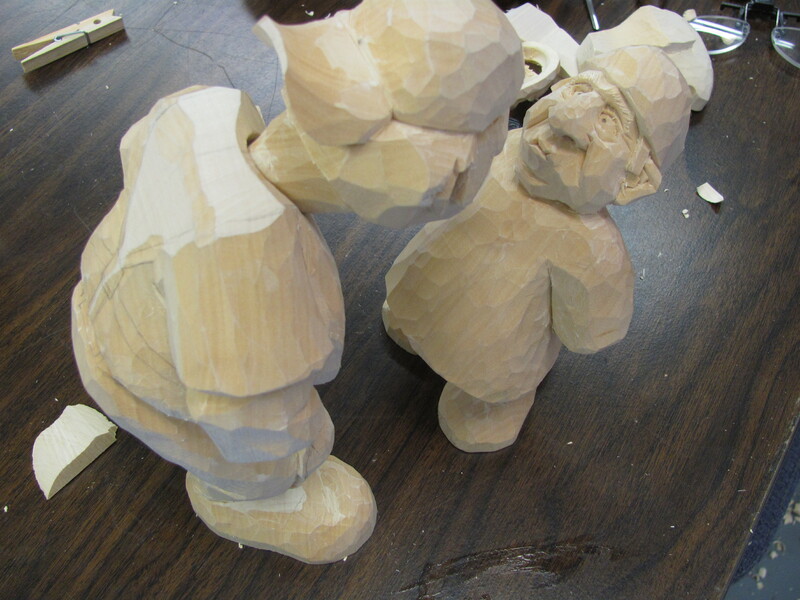 If you have looked at my post showing the wood carving instructors I’ve had, you know I’ve taken a lot of classes. Especially when you consider I’ve had some instructors multiple times. I was so inspired by the unique class I’ve just finished, I want to share a little of my experience. 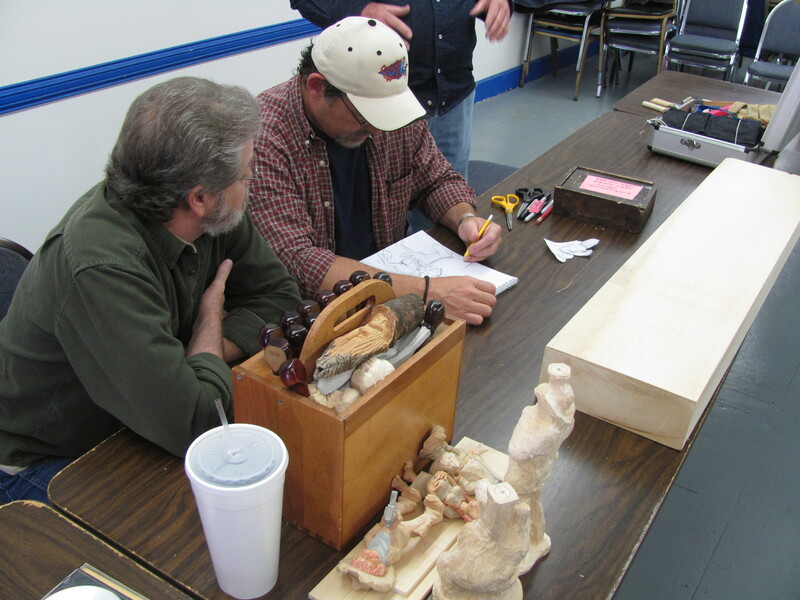 The class was five days with caricature carver Chris Hammack. 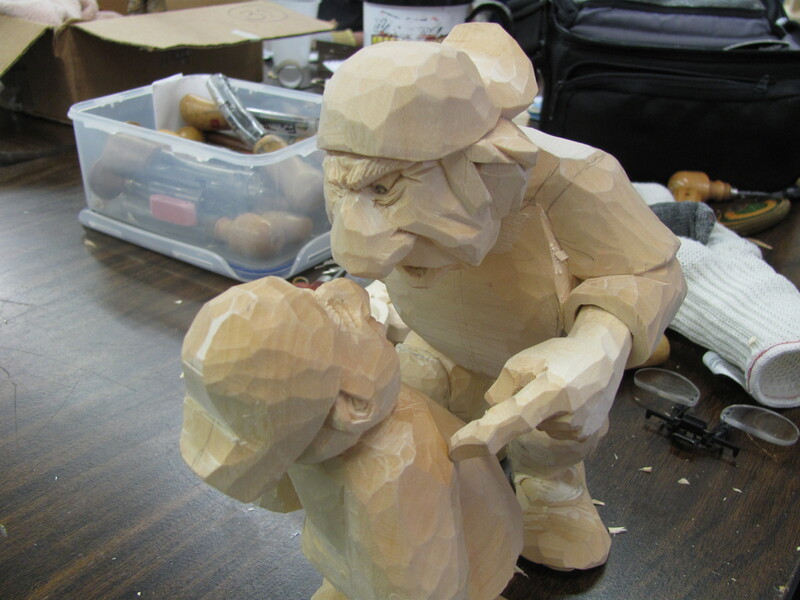 Chris has been carving professionally for many years. 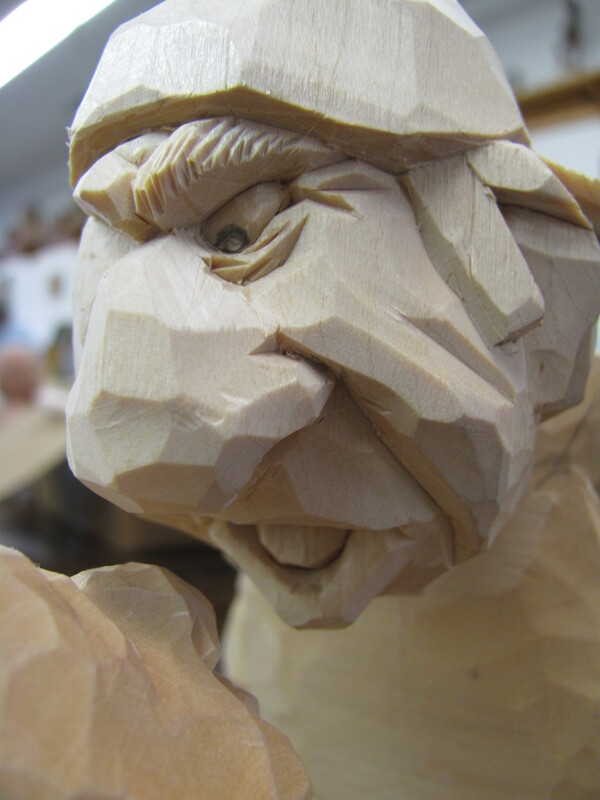 Chris is a great addition to the Caricature Carvers of America (CCA). 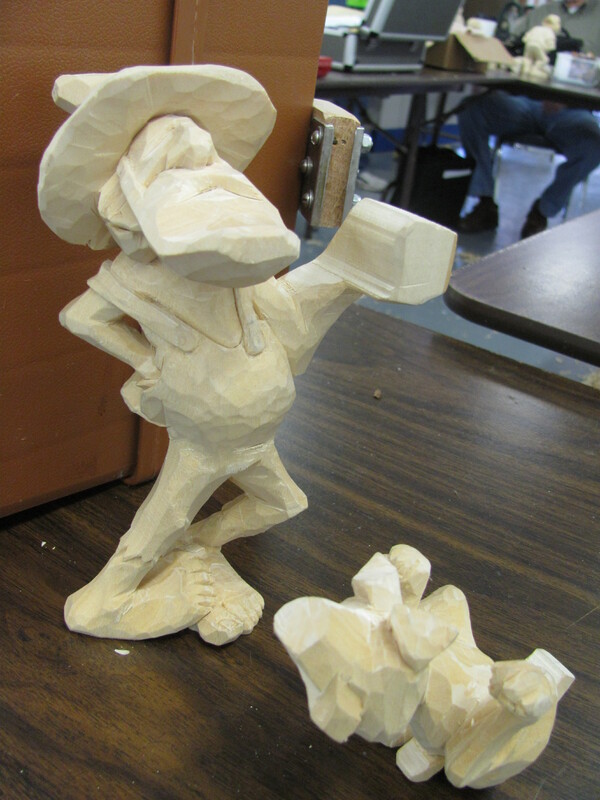 Both times I’ve carved with Chris in the past, the class has been in a more traditional format. That format is where a project or a choice of projects have been provided by the instructor. This time Chris was waiting for his seven students with a block of bass wood four inches thick, ten inches wide and four feet long. Chris (on the right) and Randy developing a sketch. 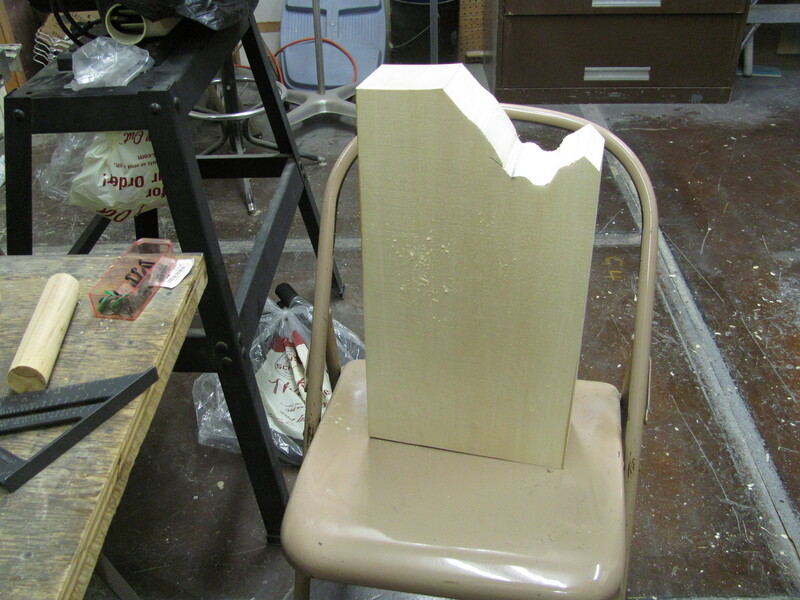 Notice the block of wood. He also had a few supplies in addition to his Helvie brand knife. He brought a lined spiral binder, a pencil, a Sharpie pen and some scissors. We arrived with our tools and ideas for a project. 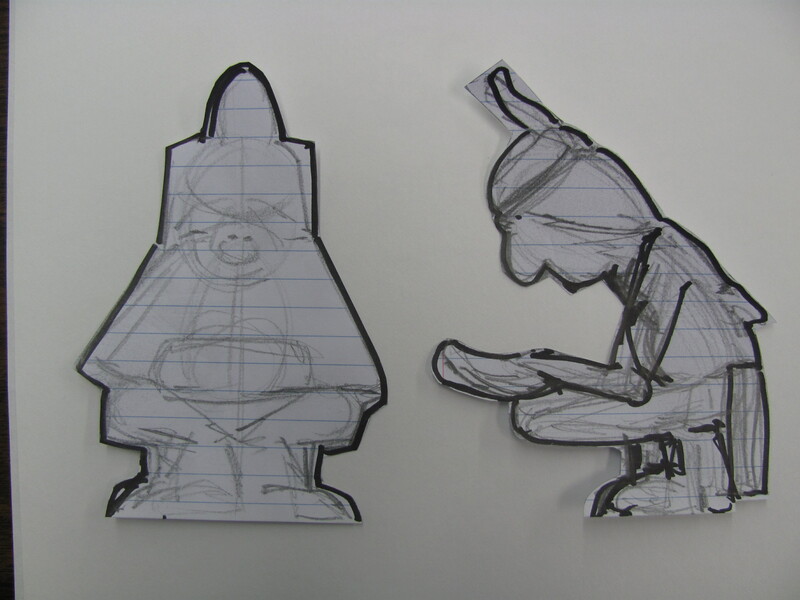 Chris had sketches of his earlier projects. Chris visited with each of us to discuss our ideas and develop a pattern. He explained the technique for sketching the figure. This included a front and side view. 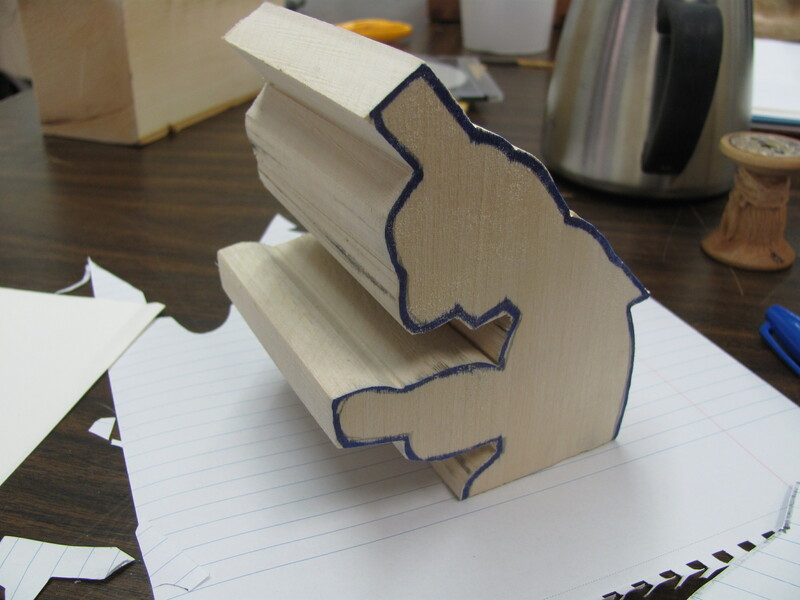 The student cut the paper pattern, transferred it to the wood and used a band saw to cut the blank. Sketch of my first figure. By lunch time, everyone was making the chips fly. Progress by lunch time first day. 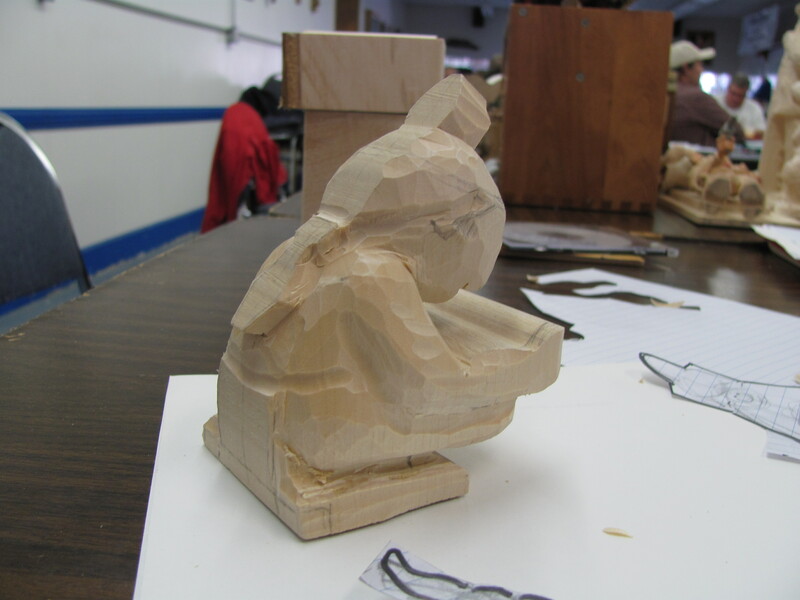 Some of our projects were multiple figures and some had the heads carved separately. 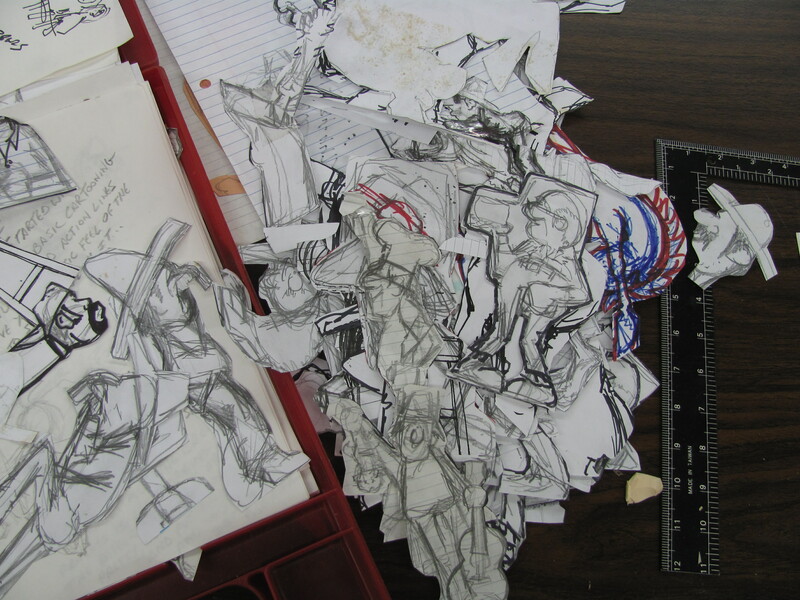 As the additional pieces were needed, Chris would assist with another sketch and the process would repeat. My first figure at 5 PM, day one. Because of the small class size, Chris spent plenty of time with each of us, sharing his thoughts about proportions and details as well as brainstorming about project features. 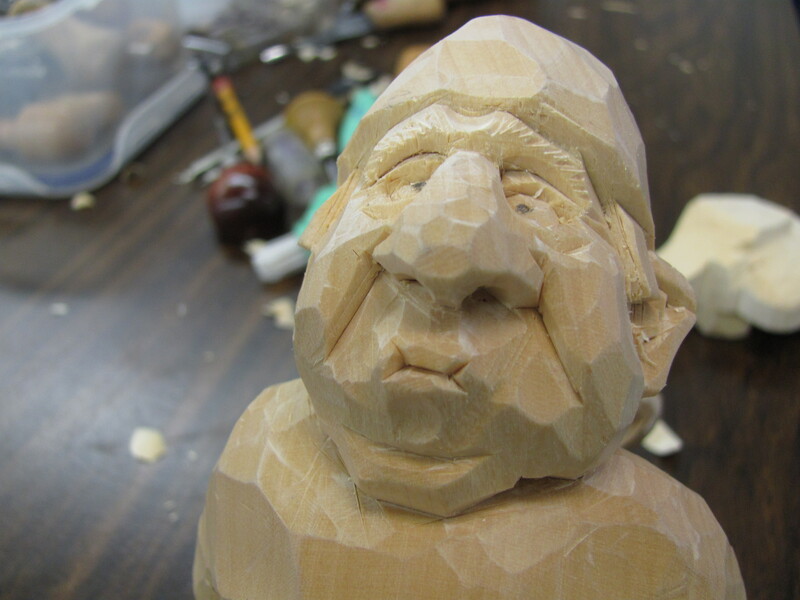 We talked about what makes a successful and entertaining caricature carving. I was impressed by the six other projects and amazed as I watched them take shape knowing they had just been ideas a few hours earlier. Although none of the projects were completely ready to be displayed at the end of the fifth day, we knew what was needed to add the finishing touches. We all had a great time, got to make new carving friends and endured good and bad jokes. We were also fed very well by the club that hosted the class. 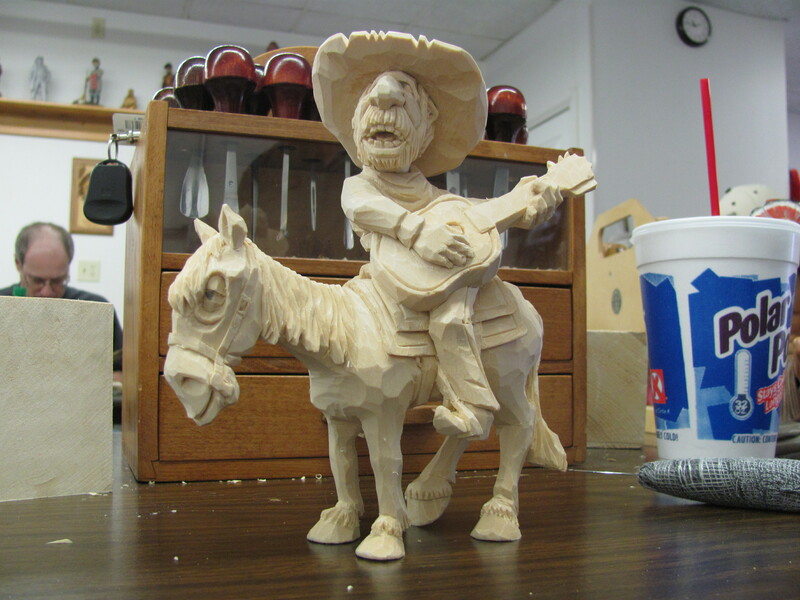 The Eastern Woodlands Carving Club is located in Converse, Indiana. EWCC is everything I think a carving club should be. They are unique in having their own building. 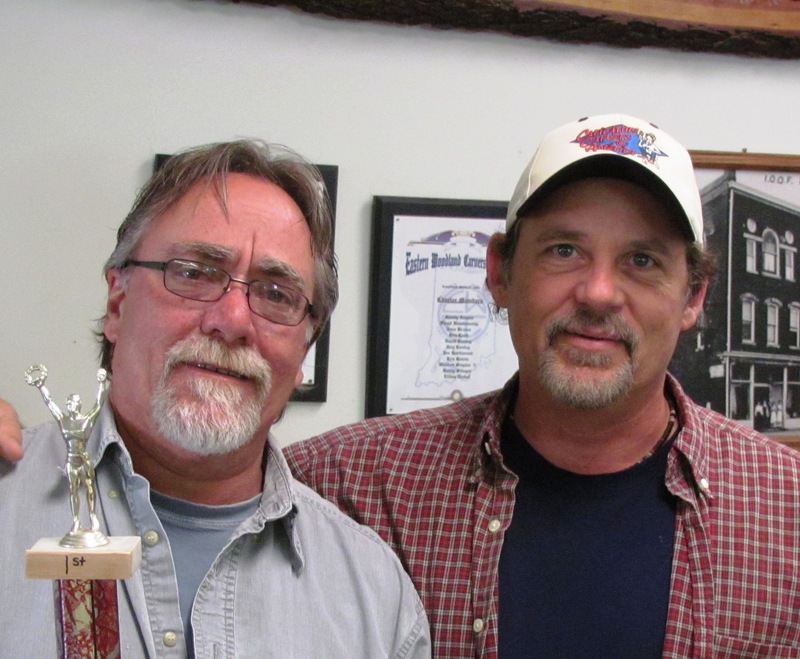 The leadership is able to maintain the building and a variety of programs to keep the local members active. They offer space for basket making classes and wood turning. The first floor has space to accommodate four carving classes at a time. It has a fully equipped wood shop, three restrooms, and a kitchen where hot lunches are prepared by volunteer members. 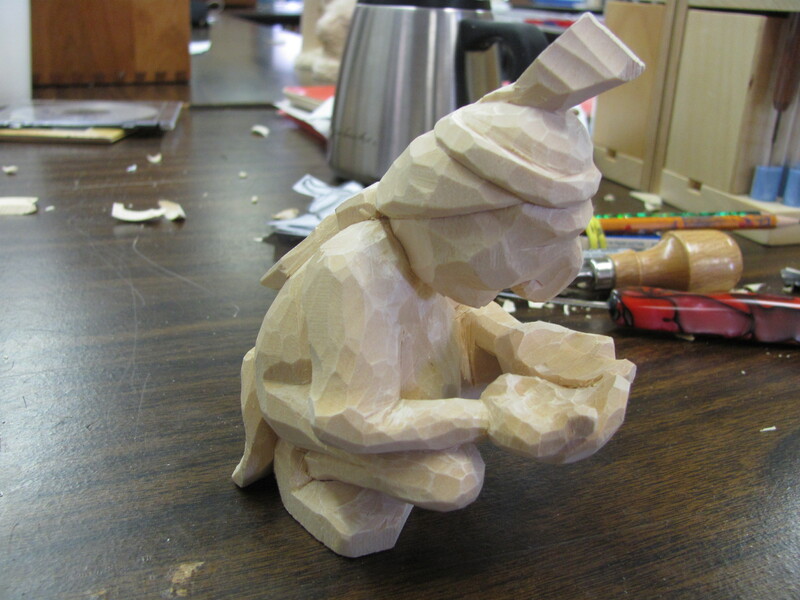 I’ve carved at EWCC seven times and have had delicious lunches each time. My first visit was in 2007. I was treated so well, I make the trip from Pittsburgh at least once a year. The membership is about 200 including myself. I wish I lived closer so I could help with the many events they host. During the first two days of our class, another class was being held on the other side of the first floor. 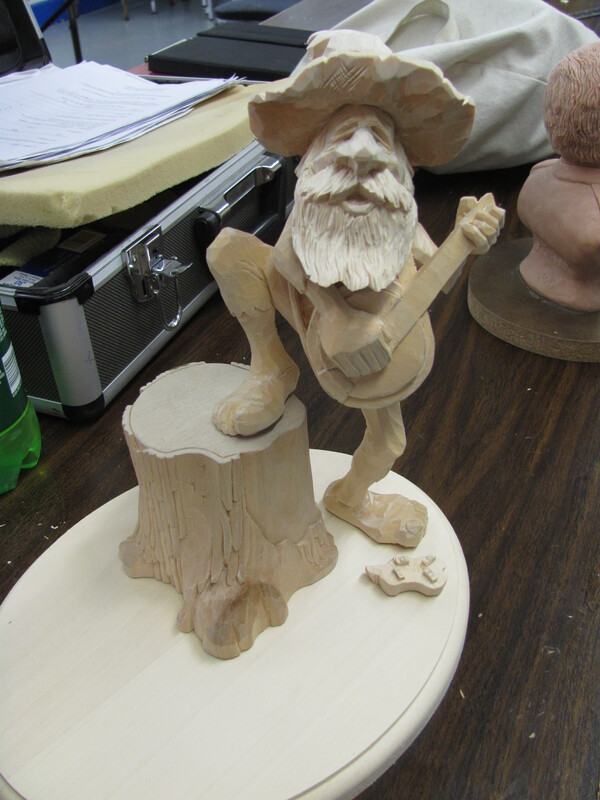 Richard Wetherbee from Colorado Springs, Colorado was working with students carving their choice of a realistic mountain man or a caricature of a bear playing a washtub bass. 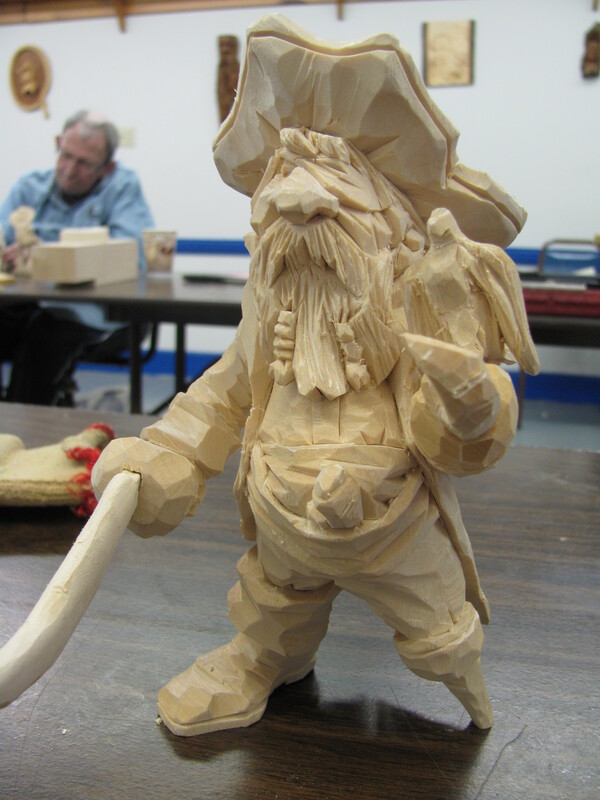 Rich is one of the founding members of the CCA and an excellent carver. I had never met Rich but was delighted to make his acquaintance. We enjoyed Rich’s company for the remainder of the week. We had two special visitors during the week. Rich Smithson spent the day with Rich Wetherbee. Rich is the owner and operator of the Helvie knife company. He donated a knife to be raffled with the proceeds going to the club. Luck was with me that day. Thanks again Rich. Friday, club founder and resident CCA member, Tom Brown stopped in to say hi. Tom’s health keeps him from being out and about very much so it was nice to see him this trip. I’m including pictures from our class with each student’s project represented. Some are from earlier in the week but you can tell they are all works in progress. You should be able to get the idea behind the project. Jack Shelton’s musician to be accompanied by a howling dog. Frank Witt’s fisherman and dog. They both have worms. The dog is skidding along pulled by his front legs. Jim O’Hara’s Old Timer about to shoot his broken down truck. The cat is not happy either. Randy Hurst is ready to paint his troubadour. 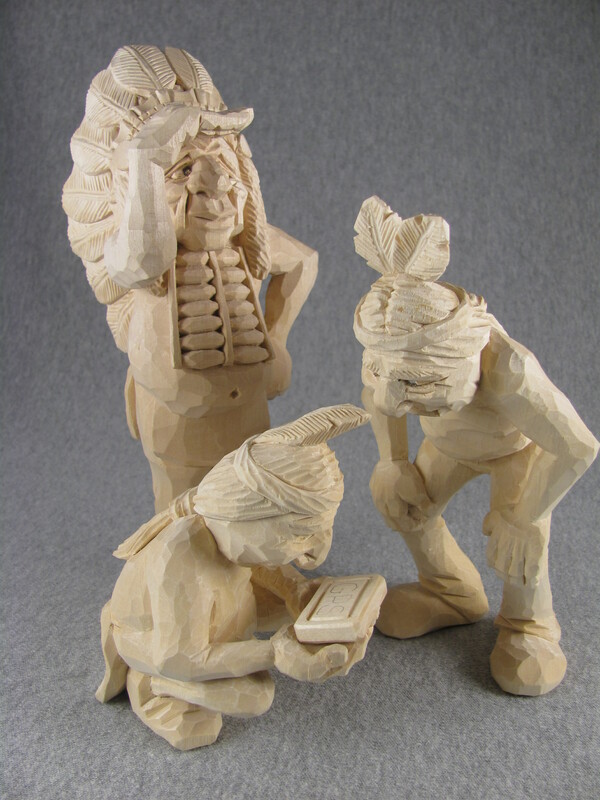 These are the three figures in my project. They’re using a GPS to find their way. Chris is a great instructor and easy to spend a week with. I’ll definitely be watching his schedule for another design class. 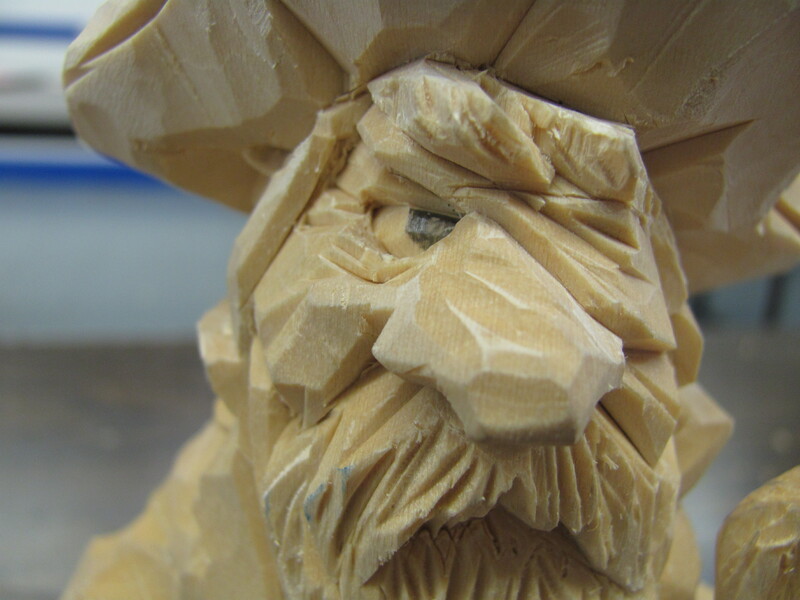 I recommend his design class for anyone who has been carving for a while. Check with Chris if you’re not sure about your skill level. Contact him at chrishammackart.com. Check my separate post of my painted project. This entry was posted in Classes and tagged Chris Hammack, indians, Rich Wetherbee. Bookmark the permalink.